The ASUS Zenfone devices of 2018 have been selling like hot cakes, especially the Zenfone Max Pro M1. And with the Big Diwali Sale underway, here are the best Zenfone Flipkart Offers. You can buy the ASUS Zenfone devices for cheaper, regardless of which payment method you select. Here are the exact details on how much you can save on your purchase. SBI Credit Card holders can avail an extra 10% instant discount on all of these phones, which makes them more affordable. Prices are calculated from the sale prices mentioned above. If you want to buy any of the Zenfones on EMI, you will be happy to know that ASUS is offering No Cost EMI on the 3 months or 6 months EMI plans. 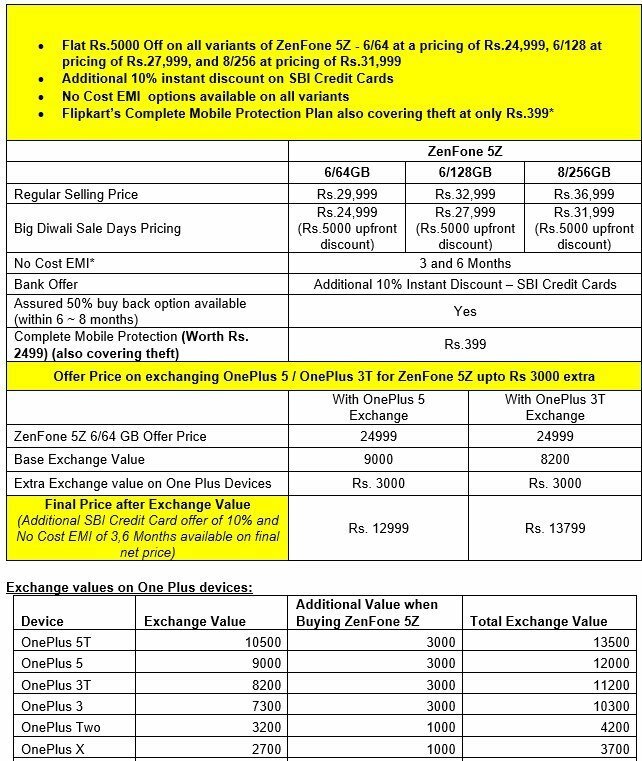 If you are exchanging a OnePlus device for the Zenfone 5Z you get more than the regular exchange value of the phones. The OnePlus X and OnePlus One offer only an extra Rs. 1,000 exchange discount, while all other Oneplus devices net you an additional Rs. 3,000 off. ASUS and Flipkart are offering the Complete Complete Mobile Protection (free doorstep pickup/delivery for repair service, covers theft insurance, accidental damage, a one-time screen replacement) for all of the above devices at Rs. 99, except for the Zenfone 5Z which costs a bit more at Rs. 399. When checking out, you can choose to buy the Assured Buy Back offer for Rs. 99, which will get you up to 50% of the phone’s price back, when you upgrade to a new phone within the next 5 to 8 months. These ASUS Zenfone Flipkart Offers are valid from until November 5th, 2018. Please read all the offer’s terms and conditions carefully, before making your purchase.